Recycled Fashion: Doc Martens, Love or Loathe? Doc Martens, Love or Loathe? 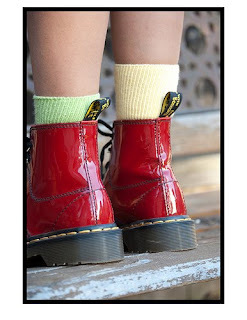 Love them or loathe them, Doc Martens boots are back, or did they ever go ‘out’ of fashion? For many, the Doc Martins ‘1460’ design is a staple wardrobe essential. The recent rise in Doc Martens popularity has been timed well, as this chunky footwear firm celebrates its 50th birthday. Not bad for small German company making orthopaedic boots, which have now developed into an iconic footwear fashion. In past decades Doc Martens may have been associated with the skinheads, the punks, the mods, the grunges etc, but their appeal may now be more widespread as glamorous celebrities such as Sienna Miller (floral), Robert Patterson (traditional black) and Agyness Deyn (many different colours) wear their boots with pride. Now before you rush out to buy your brand new shiny pair of boots, consider this; more than 100 million pairs of Doc Martens have been sold since that first pair was unveiled 50 years ago, and that must mean a heap of second hand boots out there. You may not be lucky enough to find a pair in a charity op shop or vintage store, although one lucky second hand shopper posted a success story on facebook’s op shopping group page 27 April: “doc martins - $8. red cross. sweeeeet.” And don’t forget eBay, although one pair similar to Sienna Miller's floral boots just sold for a whopping AU$345.00 with 52 bids! So, do try to look out for second hand boots if you can, they are out there. Hey maybe even your parents had some back in the day? my first and arguably biggest purchase at an op shop was a pair of black docs that had never been worn and still had tags for $50... THat was in 1996 and I still wear them to this day!!! Luckily I got chance to use this shoes 2 year back. It's very comfortable and awesome. It is one of my favorite shoes. I love these shoes. My grandmother found a pair of Dr Martens Floral Flower Sienna Miller Boots at a thrift shop for only $5! I paid $12 for my Docs at a consignment/thrift store. I had to buy them in mens because it was cheaper. They're brown and I love them.